So we are about thiiiiiis (holding up fingers like a cook describing a pinch of salt) to being homeowners. So excited! The house is a great spot for us for the next 3-5 years. 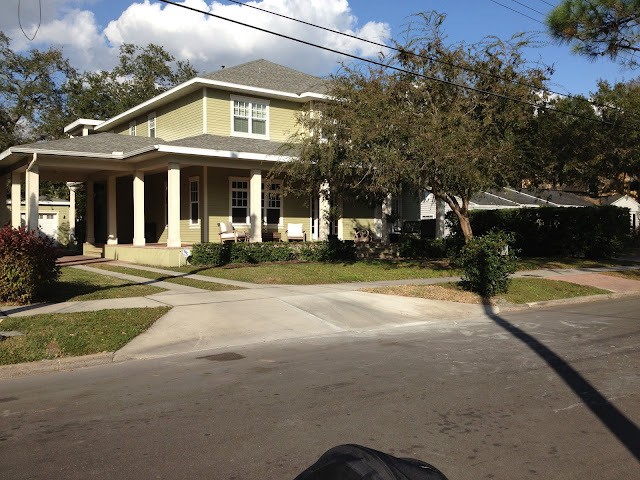 It's not my dream house as far as appearance goes, but it's very accommodating for our family in regard to location (in College Park, Orlando!) and size (4/2). I'll be the first to admit, I'm not crazy about the curb appeal. Pulling up to the house for the first viewing the husb was actually saying, "Nope, this isn't a house for us." First, we like 2-story homes. Generally this allows for more house without taking up too much yard. Our minimum square feet was 1800 since we are looking for a house we can grow into and still host some overnight guests here and there. So usually a single story home just doesn't allow for a bigger house while still having a decent sized yard for a dog to run around and one day a child(ren) to play red rover, catch, and home-run derby (that was always the favorite at our house growing up). The second thing we weren't crazy about is that the house is brick. I like brick for the low maintenance aspect, but I like the idea of painting a house whatever color I'm feeling of the moment. I grew up painting houses in the summer with my dad so this a feat that I know I can tackle. However, the brick on this house is really...I don't know...the grout (or whatever it's called) is super deep so it would have to be sprayed, which I have never done before. Hrmph. MAJOR project. Plus, all paint and supplies would probably cost $1,500+, which at this point I think I would rather spend on a new sofa or king-size bed and bedroom furniture. While we were just looking and had not yet found our lake house (love calling it that) I took some pictures of houses in our current neighborhood while walking the baby boy and dog for ideas. I either like: black & white, always a classic and never looks bad; gray, black & white, a nice color scheme that will modernize our 'new' 1965 house; or green & white, very fresh and energetic-looking. Here are the photos I took while walking the 'hood (Dale Mabry to Manhatten and Bay to Bay to El Prado). And, yes, I did feel like a weirdo, peeping Tom taking pictures of random people's houses. Is this house amazing or what? I try to always make our walk veer past this one just to get another look. I so love the adorable mailbox that matches the house. Even has same roof! Another house I'm in love with and the funny thing is that it's about 150 ft from House #1. Similar in style and color. I always wonder if these two homeowners get together for weekend drinks and talk about how awesome their homes are. It gives just enough of that Key West appeal, but not corny at all. Love a double decker porch! The tree in the front yard did not allow a good picture of this house, but it's gorgeous! Could this be anymore Americana with the white clapboard, black shutters, red front door, and American flag. LOVE! Okay, so our near future house DOES NOT look like these. I was wishful thinking when I was picturing our future home when I took these photos. Obviously, I like the large, 2-story home ideally with a large, covered wrap-around front porch. I don't even have any pictures of our house from the front, but I will post in about 2 weeks after we have moved in. However, I'm thinking if/when we do paint our new house the gray & white color scheme will look best with the brick being painted gray and the trim and bright white. Right now the trim is a dingy, off-white...wah, wah.